At the Paris launch of David Lynch’s first major exhibition of his drawings and photographs, the 61-year-old director was asked to offer some insight into the work. To seasoned Lynch-watchers, the response was a typical mixture of beguiling and frustrating. ‘What I can say is what you see. What you see is what I can say.’ The man behind the Freudian epic Blue Velvet, the perverted soap of Twin Peaks and the dreamily sentimental Straight Story always meant for his artistic output to speak for itself. 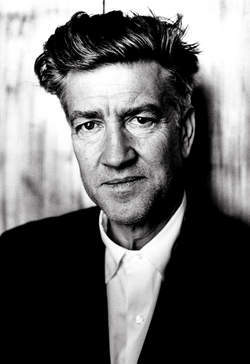 The stark imagery, oddball characterisation and often meaningless storylines have opened themselves up to dead ends of analytical debate which would no doubt have left Lynch chuckling with delight. It would surely come as no surprise that Lynch’s creative origins sparked with drawings and paintings during his childhood and the book of this exhibition, The Air is on Fire, is dedicated to his father, a keen supporter of his early work, and to his mother ‘who refused to give me coloring books.’ Lynch would go on to study fine art in Boston and Pennsylvania where he began to dabble in the world of avant garde moviemaking in Six Men Getting Sick (with stills reproduced in the book). His visual art background was there for all to see with the nightmarish tales of family terror in The Grandmother and Eraserhead. The influences of Francis Bacon, Man Ray and Wassily Kandinsky can be spotted here and there, but the majority of the book can best be described as profoundly Lynchian. His obsessions with the frailty of the body should conjure memories of the severed ear in Blue Velvet, the mewling offspring of Eraserhead, John Hurt as John Merrick and Willem Dafoe’s semi-comic decapitation in Wild at Heart. Here Lynch is rampant, from the self-explanatory snaps of ‘The Amputee’ to his ‘Distorted Nudes’ series and even the final photos of a snowman in meltdown. To those who have often accused him of objectifying women, there’s plenty footage to get hot under the collar about with his ‘Nudes and Smoke’ section. When asked in the book’s interview and accompanying CD by long-term Lynchphile Kristine McKenna whether the models in the pictures are irrelevant, he denies this: ‘the way the light goes on ‘em . . . gives you so many ideas.’ But perhaps the most intriguing selection is the human-free set of photographs of industrial decay from Poland and America. The broken windows, damaged pipes and oil-stained walls hark back to arguably his finest artefact, Eraserhead, where his art and cinema first fully clashed and merged to magnificent, disturbing effect. It’s fortunate that David Lynch has been a compulsive hoarder throughout his life, so that four decades of work can be brought together in one arresting collection. While it may not have the lush drive of his movies and their music, and you feel the absence of the off-kilter dialogue and the clanking, hissing sound effects, the book still has an intensity and build all of its own. It shows an artist growing steadily into his voice and a man who conforms to no one’s values other than his own. The Air is on Fire is out now published by Thames & Hudson.